Adam starts off things on the site with a good luck charm; Discussing Joel and Ethan Coen’s masterpiece Miller’s Crossing. Though Raising Arizona was his first, it was Miller’s Crossing that made him a Coen Brothers obsessive. Jon Polito is the GOAT of Coen Brothers film. Don’t @ Us. 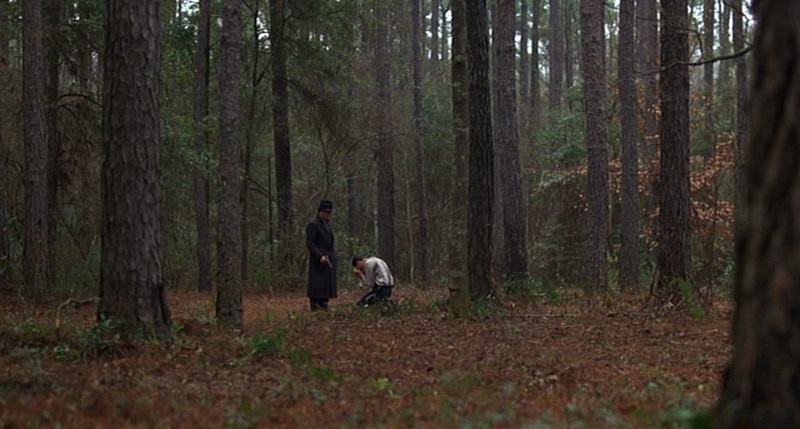 Miller’s Crossing has the Coen Brothers taking their basic plot from Red Harvest. Though the directors have contorted the novel’s often used plot to their own needs. What they have produced is a specific world of fedoras, tough-talking dames, fast on the trigger gangsters, and quick fist-a-cuff coppers. The Coen Brother’s screenplay has no less than six subplots that weave together the tapestry of Miller’s Crossing. Trying to explain the plot can leave you dizzy. Danny Boy, oh Danny Boy, the Thompson Sub-machine gun is calling. There are few films that can elegantly juggle so many subplots and never make them seem like work to watch unfold. Miller’s Crossing, though serious in tone and execution, has a playful comedic streak that is so deadpan you may miss it upon your first viewing. Leo (Albert Finney in one of his last great performances) is at home and is attacked. He takes a Tommy Gun to his assailants while “Danny Boy” is playing. Or the nameless cop’s single shot that erupts into a gunfight (Sam Raimi in a perfect cameo). Or Caspar’s interaction with his son while he meets with Tom to negotiate his betrayal of Leo. All these moments create a sense of dark, but playful, humor that actually gets funnier the more times you watch the film. directed. The way the tables turn. The way the audience quickly realizes Tom may not be the hero they want. The final moment of Bernie’s life playing up the act for Tom then genuinely being scared as he knows what is coming. The Coen Brother’s understand there is no need to be twee or cute in this moment. “I have no heart” is all that needs to be said. The film gets across what the Coen Brothers would purport in the heavier-handed No Country for Old Men – the world is populated by heartless evil men. Unlike that later film, there is much more vibrancy and vitality on display in Miller’s Crossing. The advantage that Miller’s Crossing has over No Country for Old Men? There was no concern about making “IMPORTANT MOVIES”. They were fearless, playful, and had a bravado that’s been subdued in recent years. The implosion of a big budget passion project had yet to occur (e.g. their aborted adaptation of James Dickey’s To the White Sea starring Brad Pitt). Nor had the critical backlash to the wrong-footed choices they made in the early 2000’s (e.g. The Lady Killers, and Intolerable Cruelty). Miller’s Crossing, though dark, is a film from directors that see the infinite possibilities of cinema. The final moments of Tom and Leo reunited, walking the titular Miller’s crossing, is an end of an era between these two men, but is also optimistic. The walk and talk between these two archetypes (the crime boss and his right-hand man) is a staple but how the Coen Brothers end the scene and their film is wholly unique and different. That may be the perfect summation of the Coen Brothers and their films – something wholly unique and different. Miller’s Crossing is available on DVD, Blu-Ray and Streaming Services.